Skip, I always get lucky in one way or another. Craigslist has been a good source of buying and selling. I picked up all the seasons of Seinfeld on Craigslist. I believe it was 35.00 or somewhere around there. I am also picking up the first 5 seasons of 24 for 50.00 this week from a college student strapped for money. I thought I got a good deal paying $90/each for similar cabinets. They are very solid. I screwed them together and then anchored them to the house supports. They are not going anywhere. I had a bookshelf that was holding aboult 600 DVD's then I started looking for an eaiser way to store them all. I decided then that they were taking up too much room and found these so called DJ boxes that hold 1000 dvds. 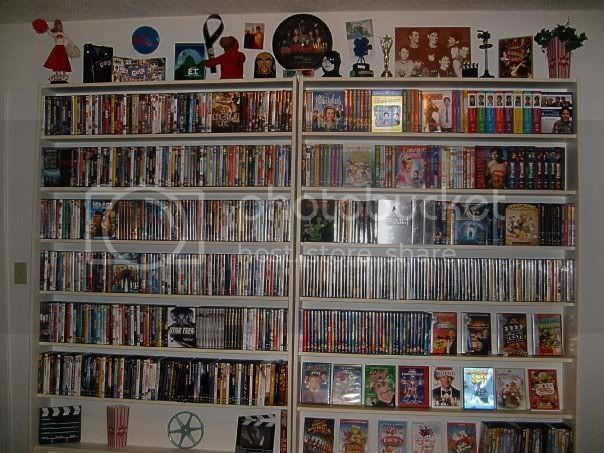 I bought 2 of them and moved all my dvd's to the first case and got rid of all the cases. (It also made it easier to number them using DVD Profiler so I would know where each disc is) Well now after filling the 2 cases and having the about 1300 in sleeves in a dresser on my spare room. I have decided to build my own cabinet using the sames sleeves from the DJ boxes. The one I am designing will hold roughly 14,000 discs in 14 drawers. I am hoping that this will last me awhile. I stack them all over, especially on the sofa and all the chairs. they have to stand outside in the hot Arizona sun. They don't stay very long, so you can get back to watching your DVD collection. they have to get hotel room and so they don't stay don't long. Alphabetically: Box set (actors, directors, genre, etc.) Criterion; Animation/Anime; Crime/Mystery; Documentary; Music, Musicals; the rest. I only own 300 DVD's and about 300 music CD's and I've found DVD albums to be the best. I use Case Logic DVD albums. Here's a link to the largest one I've seen that holds 200 DVD. With refiillable album inserts you can get about another 20 or so DVD's inside that album since it has space. If you have 4000 DVD's then you'll only need 20 of these DVD albums. They stack neatly and you can grab one or two of them to take with you if you want entertainment on the go. To find them, you'll need to catalog & Number each album1-20, then label each DVD inside of DVD Profiler. I've already tested this and it can be done. you have to edit one of the custom fields for each DVD and the puut the acalbum number that DVD is located in. You just have to take the time to do it. Do I see AXE in your collection? 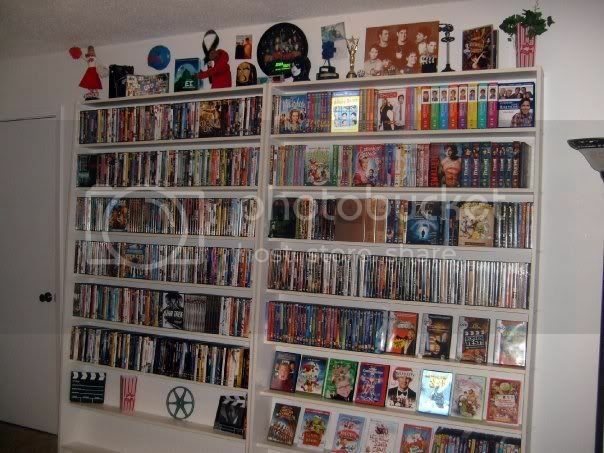 2 shelves under your STAR TREK films, red side, to the left of Star Treks. IS that AXE? AXE is not part of my collection. The only problem is I can't find anywhere in Canada to buy some new Case Logic folders, looking at the DJ Cases I'm leaning towards getting a couple of them. I'm at about 3500. I can fit two more large shelves in front room, then I have to cut back, use other rooms or buy a new house. If you want more case logic folders try www.meritline.com I can't speak for if they ship to canada or not but it's worth a shot.